That sinking moment when it becomes clear you didn’t teach vocabulary as much as you should have. There were some things that went well with this unit and a whole lot of new ideas for the next time we teach it, but I wish I’d done a better job emphasizing academic language, especially when the kiddos mistake “similar” for “same”, which is…reasonable, but problematic. Each round of portfolios brings new ideas and new growth. I feel like I pushed students to do more brainstorming with scaffolds (though there’s a TON of growth I want to do in that area next round). I feel like the support I was able to offer fell off as the week went on. This student had some decent ideas. I definitely didn’t push them as much as I wanted to on formatting or translating those ideas into English (which is a common theme that I saw during this round). 3 Read Protocol: I went to a workshop on the 3 Read Protocol. (and yes, this links back to something from my own district, though I’ve never used it before. Oops.) The idea is to take a relatively dense word problem. You as the teacher read it aloud once. 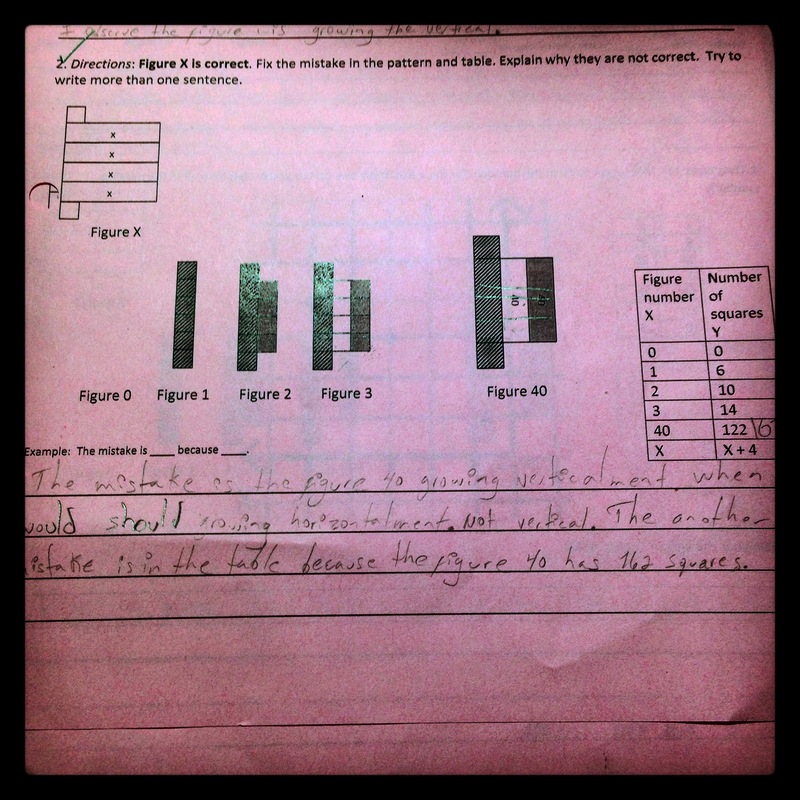 You ask students to summarize the main idea. You (or a student) reads it aloud a second time, this time asking students to look for the math – numbers and quantities in the problem. You (or a student) reads the problem aloud a third time and students come up with a list of questions they can answer. This feels like a great exercise to try with English Language Learners and feels like a good structure to help students strategically make sense of problems. 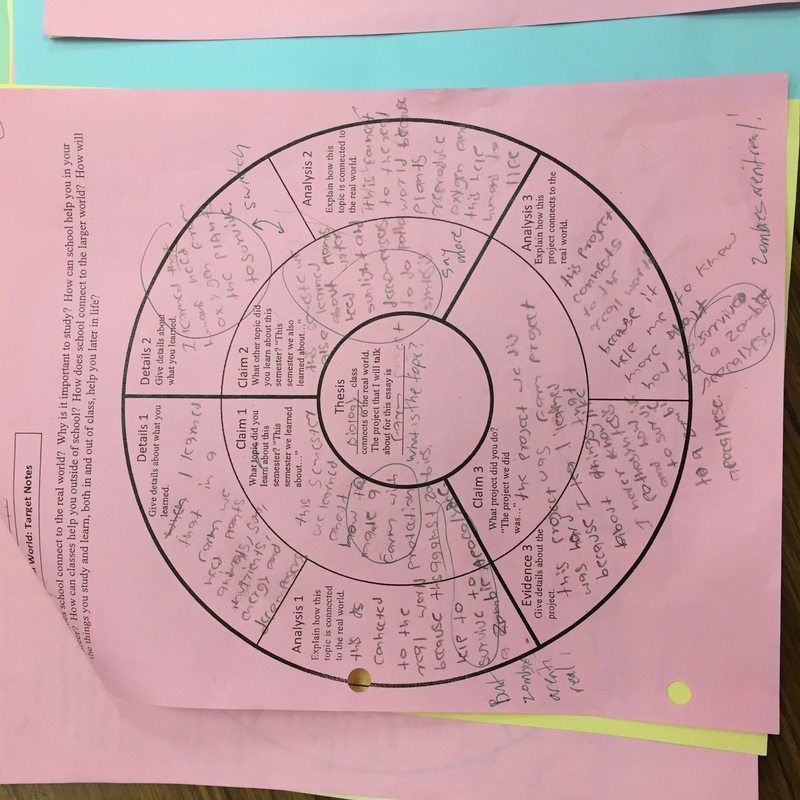 It also dovetails nicely with norms we’ve been establishing about “read the question (many times) before you ask for help.” Huzzah student persistence! Course Narrative: I went to another workshop on establishing coherence and narrative throughout a course. The workshop was designed for biology teachers and our course narrative (or, uh, lack thereof) feels choppy for many reasons. That being said, thinking about how one unit motivates another is something I haven’t done (But feel like we should engage further. Maybe next time we teach this course). We’re going to try using guiding questions for each unit to try and help students make sense of how the content in each unit is connected. We’ll see. Talk: Our cohort, which is mostly second and third year teachers (and two fourth year teachers) is focusing on “talk” in our classes – how our students talk and how this helps them learn. Up until this point, I’ve mostly tried to get students to talk to each other for the sake of talk and speaking English (because: English Language Learners). So I’m excited to think about this and get more into details and figure out why I’m asking my kiddos to talk. This also dovetails nicely with a book that Mr. Williams recommended on Intentional Talk. Geared to elementary schools, but that’s not such a bad thing. Teacher Leadership: Everyone at Summer Meeting read Jose Vilson’s “This is Not a Test”. One of the many themes that emerged was the idea of teacher leadership and teacher voice. How do teachers communicate the work that we do? How do we advocate for ourselves and our students? No easy answers here, but I’m excited to see the conversation grow and continue. Norms and Shared Experiences: Our cohort of 30 teachers spends lots of time together. We have a meeting in the fall and a meeting in the spring. We do Google Hangouts every other week. We’ve gone through a year of teaching (for some, the first year). So we’re close. Similarly, other cohorts are very close. It’s really interesting and tricky to see what happens when these different cohorts with different experiences and expectations come together. Often times, they don’t. One of my biggest takeaways is thinking about how to bridge those gaps and talk to people with different experiences and expectations. Content is over. Portfolios are here. 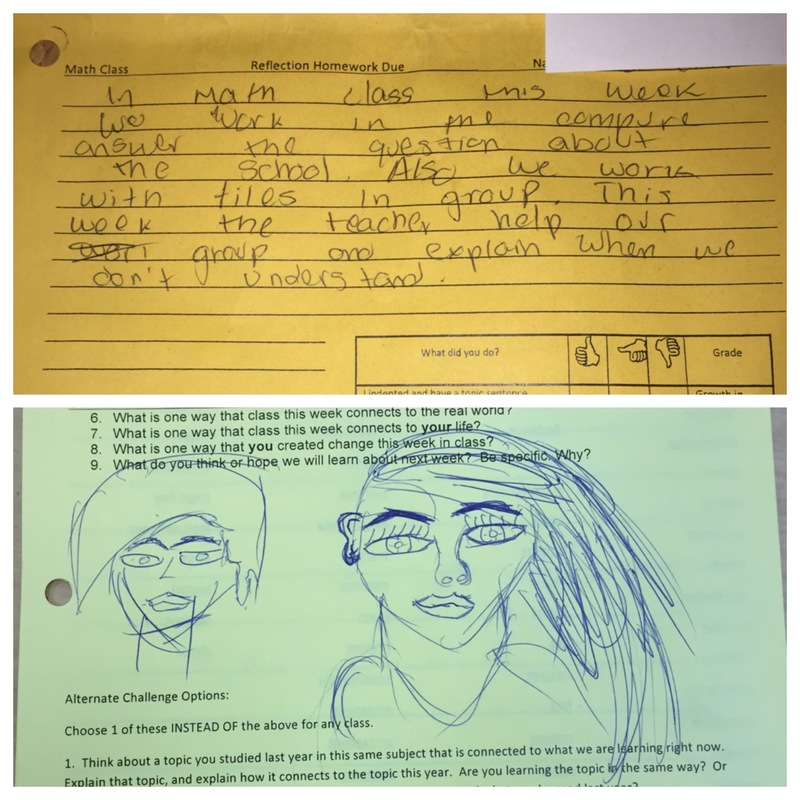 Because our kiddos are all English Language Learners, our summative assessments look a little different. Content ends two weeks early and the kiddos spend the majority of their day with their advisor, writing and reflecting on what they’ve learned during the semester. Photo 1: Target Notes and Post-its To help the kiddos organize their thinking, we have them complete a graphic organized called a target note (because it’s shaped like a target). They fill out their thesis, make 3 claims and support those claims with evidence and analysis. (Some of our awesome teachers revamped them this year so that the format is easier to follow and has the kiddos talk more about what they’ve learned and the projects they’ve done). One kiddo had another teacher proofread their target notes after school. 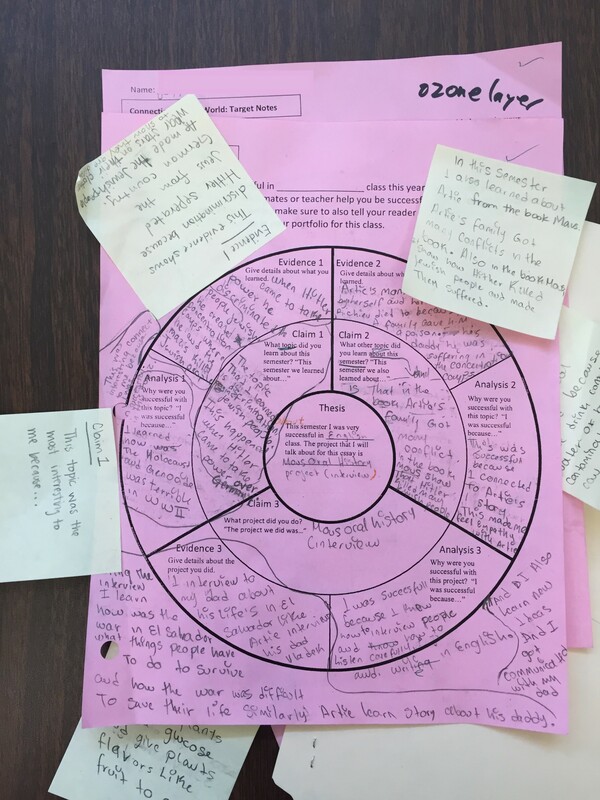 The teacher had some great ideas and rather than having the kiddo write them into the target notes, had them write their revisions on post-its. I find that some kiddos are resistant to revising their writing since it means “more work”. The post-it note reduces some of that “work” and also helps them see the changes they’ve made. (I suspect most kiddos aren’t used to doing multiple drafts or the idea of reading something to make it better). Curriculum partner was out Friday and we needed our kiddos to fill out a district survey on positive school culture. So, we spent the first part of class signing onto computers and filling out a computerized survey in English, Spanish or Chinese and the rest of class (25 minutes for students, 0 minutes for others) catching up on homework or doing other stuff. Photo: The Other Stuff In retrospect, one thought we’ve had this year regarding homework is that it’s good to have it, but it’s also good to build time into the school day to do it. We have an afterschool tutoring program that quite a few kiddos take advantage of, but many of them have to work after school. This is my long, roundabout way of saying that some kiddos (with a lot of prodding) caught up on homework that needed to be done. Others…doodled a lot. 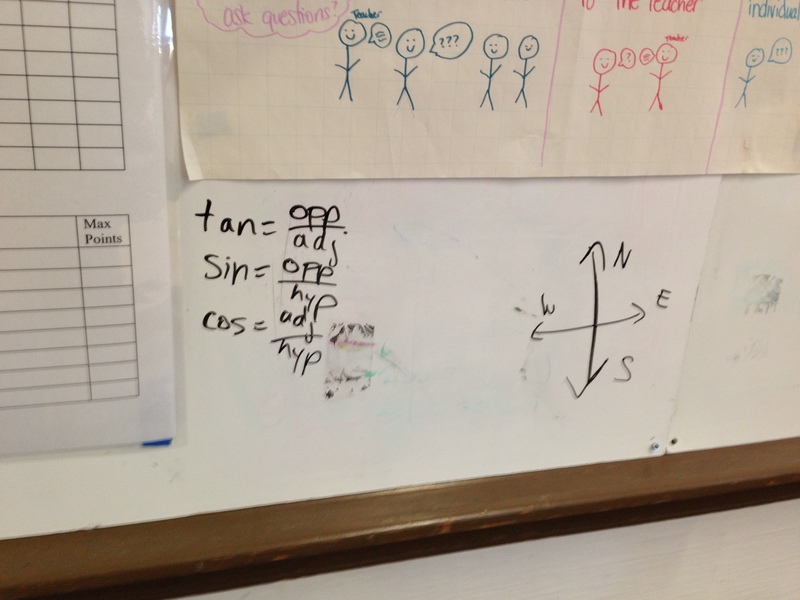 lots of kiddos got caught up on questions, even in their home language. I wonder about some of the phrases they used (I had trouble understanding it, so it must not have been an Ecuadorian translator). I think some of the questions were unfamiliar to kiddos and helped push their thinking (I hope). Kiddos did a strong job of not giving up, even though there were lots of questions with academic language. New mini-unit starts Monday. Cross your fingers. Curriculum partner and I are testing a new unit assessment structure, which consists of a group test (today), a written study guide reflection (tomorrow) and an individual test (Friday). The group test went surprisingly well today (knock on wood). Most groups worked pretty productively the whole period. One class struggled a bit, but I suspect reasons other than the test). Both the group test and individual test focus on conceptual questions – who’s right, fix the mistake, fill in the next step type problems. We also ask students to write about their work and their thinking.We’re hoping this will move away from strictly procedural problems and will give access to students who may not understand an entire concept but can at least show some understanding. This particular student stepped up their game quite a bit. Lots of speaking English, lots of working with the group. For someone who didn’t speak much English at the beginning of the year, their answer shows a lot of growth in English (I think). Limiting questions can be a thing. I’ve been working on getting groups to ask group questions rather than individual questions. That is, they’re supposed to check with their entire group before calling me over. When they call me over, I acknowledge the person calling me over (the Resource Manager), then ask someone else the question. The idea is that the group will have already discussed the question with all group members, who will be familiar enough with the question to ask the teacher without being prompted. Today, we further limited students to only 2 group questions during a 55 minute period. Very few groups even asked one question and no one used both group questions (as I recall). Also, students like a bit of drama. Curriculum partner and I wanted to hold groups accountable so we decided to only review one quiz from each group. I picked randomly and students were generally transfixed (out of fear that their test would be chosen and out of fear that someone else’s test would be chosen). A bit of random ceremony does wonders for everyone, I guess. 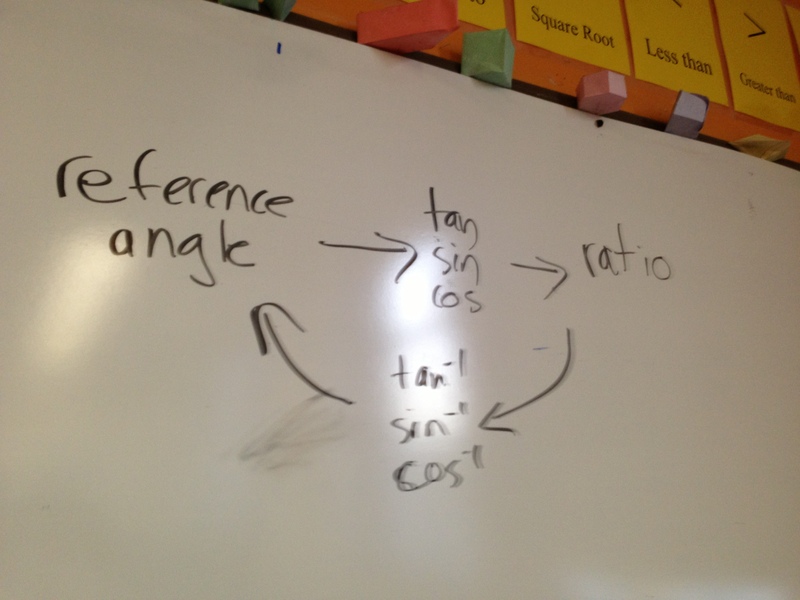 Today, the last classes finished the Trig Unit Quiz. 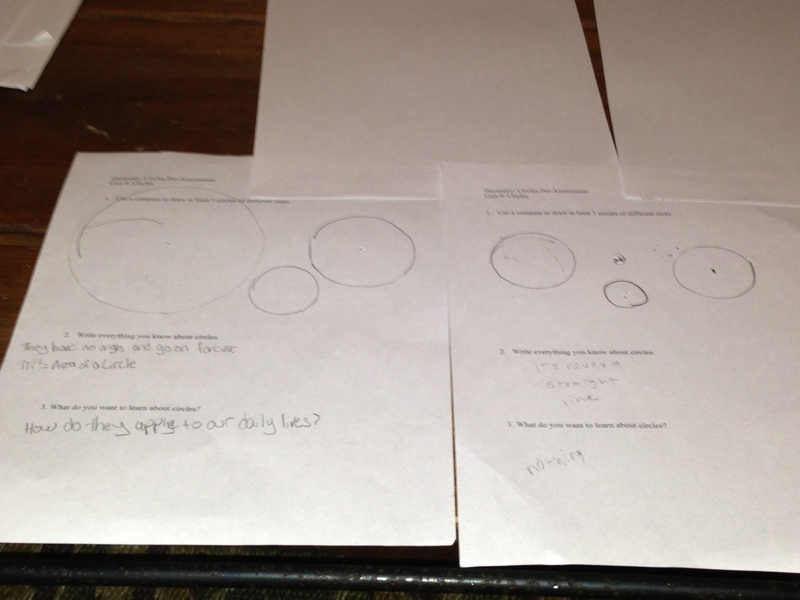 To prepare for our next unit (Circles), we had them do a pre-assessment, which included drawing circles. They seem to get the basic ideas, but seem to be hindered by the compasses themselves (which are somewhat cheap and flimsy). Toying with the idea of giving them pre-drawn circles. We’ll see. For the end of each unit, we ask students to reflect on the work they’ve done for the unit – what went well, what they’d like to improve upon, what pieces of work reflect their best work. 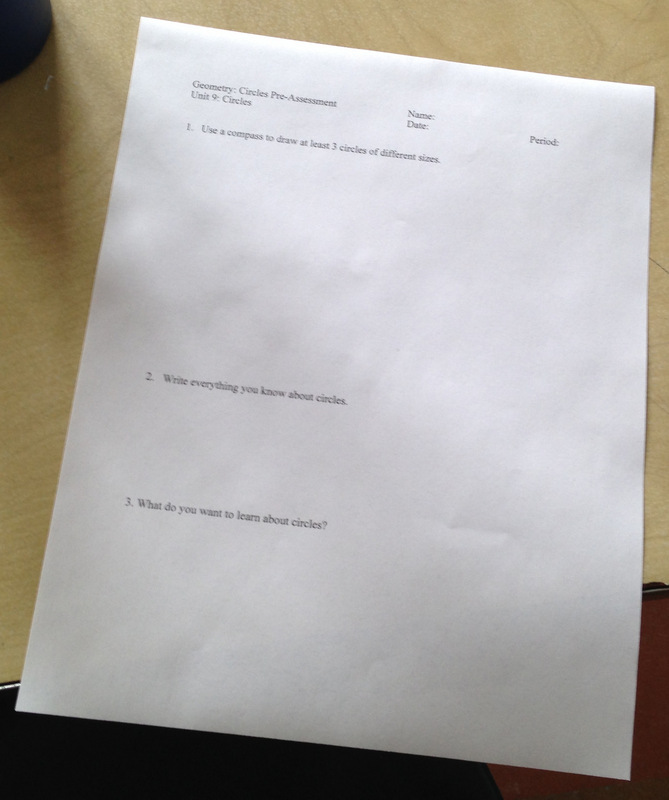 We’ve decided that a short reflection worksheet is (so far) our best bet at getting that done. One of the things I’m thinking about is how to increase students’ use of academic language. This unit, many of them struggle with the word “adjacent”, which is something I take for granted. It’s not spelled the way it’s pronounced and it’s pretty complicated for just trying to say “next to”. 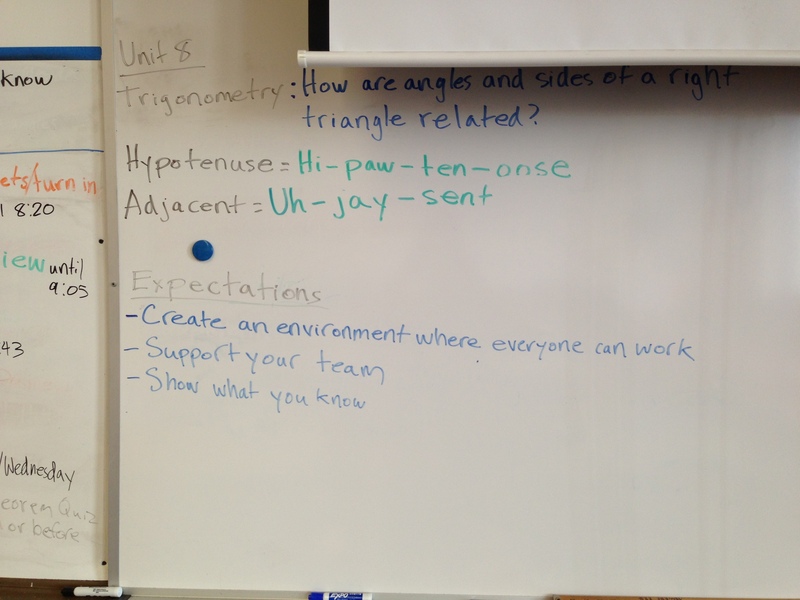 So we wrote it on the board with a pronunciation key and try to make students say it as much as possible.